A third period rally by the Terriers went for naught as UConn scored in overtime for a 3-2 win at Hartford’s XL Center in the first game of a home-and-home series. The loss—the sixth in a row for BU—combined with Maine’s tie against Merrimack, left BU tied with the Black Bears for seventh place. 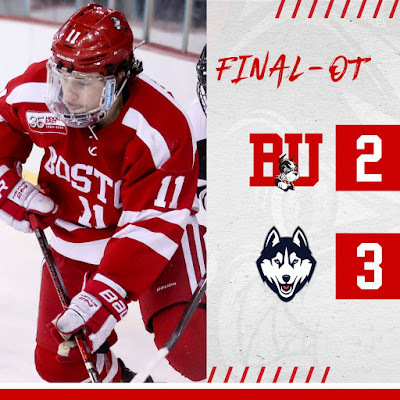 BU trailed 2-0 after two but received third period goals from Patrick Harper and Patrick Curry—an extra-attacker tally—to force overtime. UConn scored twice in the first period. The first came on the power play at 7:24 when Karl El-Mir redirected Philip Nyberg’s blast from the top of the left circle. Ten minutes later, the Huskies capitalized on a BU turnover when Wyatt Newpower fired a wrist shot through traffic past Jake Oettinger. The middle period produced no goals, despite a dozen penalties that yielded two power plays for BU and one for UConn. Midway through the third period with the team’s skating four-on-four, Harper scored on a wrap-around, assisted by Dante Fabbro and David Farrance. BU pressed to score an equalizer and pulled Oettinger for an extra skater with just over a minute remaining. Farrance found Curry in the right circle for a one-timer that became his career-best 11th goal. The Huskies went on the attack when overtime began. Oettinger saved El-Mir’s shot from the left circle, but Alexander Payusov pounced on the rebound for the game-winner. The team's meet again tonight at Agganis Arena with puck drop at 7 p.m. The game will be lived-streamed on TerrierTV. 2019 recruit Robert Mastrosimone scored his 19th and 20th goals—including the game-winner—in Chicago’s 6-1 win against Muskegon. The speedy wing from East Islip, NY added an assist to raise his point total to 38. #7 Terriers host New Hampshire at Agganis Arena today at 3 p.m. , beginning a home-and-home with the Wildcats. The game will be live-streamed on TerrierTV. BU, which will be looking to extend its current 11-game unbeaten streak, needs just one more win to clinch home ice for the Hockey East quarterfinals and can finish as high as second in the league standings. BU defeated UNH in the teams’ only prior meeting this season—a 3-2 win paced by a pair of Sammy Davis goals. Davis was named MVP of the Beanpot after her overtime goal delivered the Terriers’ first tournament title as a varsity program and its first since 1981.